The chapter provides a snapshot on the use of social networking in academic libraries through a systematic review of the available literature and an examination of the libraries’ presence on the most popular social networking sites. The chapter initially reviews 819 articles of empirical research, viewpoints, and case studies, based on keyword(s) search “Web 2.0 + Academic Libraries” since 2006 found in the Library Literature and Information Full Text Database. Out of full text research papers, articles with empirical studies, 328 (40% of 819), are shortlisted; all articles are from journals having impact factors (as per ISI Thomson Reuters rating 2011-12), 0.8 and above. The articles are collected from four major management and library science publishers: Ebscohost, Science Direct, Taylor and Francis, Emerald Insight (including EarlyCite articles, Backfiles content). The potential limitation of the study is that it does not attempt to trace out trends using any regression techniques. The extension of this study could be statistically testing the figures observed in this chapter and laying down a grounded theory approach for future research in Web 2.0 applications in libraries. The important finding is that the popularity of the various social networking sites can change quickly on the basis of e-World of Month (e-WoM). Libraries in higher education have always had a key component of their services focused on providing not only the necessary academic resources to students to meet their information needs but also with the training and skills necessary to access this information (Miller, 2005). With the explosion of resources available on the Web the ability of students to become information competent in the ethical usage, access, and evaluation of these resources is increasingly imperative. The emerging focus is on assessment and student learning outcomes, how libraries are going to provide these services to online learners? How libraries are utilizing library 2.0 tools such as social networking to meet the demand for Information Competency. Higher Education Institutions (HEIs) in developed countries have started using social media for the provision of quality education and the production of valuable research; however, the situation is not very encouraging in case of many developing countries (Casey, 2005). Since term Web 2.0 was coined by O’Reilly (2005), it has been growing into one of the most popular words in our current network environment, undoubtedly extending its influence to the library community. New tools and services utilizing Web 2.0 are changing the way people use the Internet, making it easier to collaborate, communicate and share information. Web 2.0 is a completely new and interactive experience where everyone can create and collaborate within a community. Web 2.0 is a progression from reading static Web pages to interactive ones, and from one-way dialogue to group conversation (Jahnke, 2008). Application areas including blogs and wikis, social sharing services and social networking services. The ease of reuse of content elsewhere through syndication formats such as RSS and Atom and other embedding technologies. A culture of openness and sharing, which has been helped through the development of copyright licences such as Creative Commons. The concept of the “network as the platform” by which services are hosted on externally hosted services and accessible over the network, rather than a managed service within the organisation. Web 2.0 tools allow users to create, describe, post, search, and communicate online content in various forms, which range from music, bookmarks to photographs and documents (Macasskill and Owen, 2006). Literature also cites that Web 2.0 tools have an all pervasive impact throughout the society (Bindsell, 2007). Recent studies shows that online social networking sites are very popular among the students (Chu and Meulemans, 2008). The Library and information centre version of Web 2.0 is known as Library 2.0 (Miller, 2006; Notess, 2006). Michelle Alcock (2003) and Belinda Weaver (2003) state that blog is a wonderful tool for informing readers of changes, additions and developments in the Library. Clyde (2004) cited that Web logs were used for providing news, information, and links to the Internet resources for library users. The term Library 2.0 was coined on the LibraryCrunch blog (Casey, 2005). Benefits of Library 2.0 are published by Chad and Miller (2005) and Miller (2006). 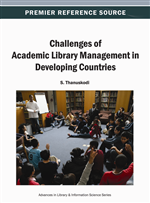 Leading libraries in developed as well developing nations have made steadily increasing efforts to equip their traditional library Web sites with more 2.0 elements, a process being called Library 2.0 (See Figure 1). Among Library 2.0 utilities as cited by Stephens (Stephens, 2006) library blog can be used as tools for getting feedback from the users on important aspects and transparency can be maintained in the organization. Frumkin (2005), Clyde (2005), Chawner and Lewis (2006), Stephens (2006) have studied the importance and application of wikis in the libraries.